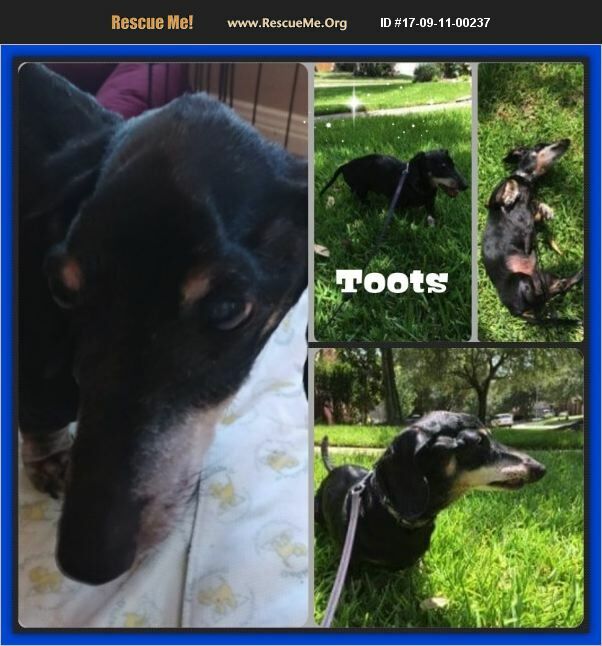 Mr Toots is delightful, endearing 14 year old, 12 pound of senior dachshund boy who is a strong alpha boy and likes everyone to remember that he runs the show! Toots is crate trained and leash trained. He tolerates car rides well and has never gotten car sick on his occasional trip out of the yard or house. Toots likes to sleep in his crate and night and enjoys his own me time. Toots is a fussy eater and likes soft food, or better yet HUMAN food! His preference may be due to his limited number of teeth - about 4. His foster mom, in Texas, feeds him a bit of hard food mixed in with his soft food. Toots would do best in a somewhere he is the only dog or there is only one other dog. He doesn't like dogs that are bigger than him as he knows he is the biggest bravest dog that there is! He does fine with dogs his size or smaller than he is and does well with kitties who do not try and challenge his 'Toots authority'. Toots is not house trained but is used to wearing a belly band and does need to be watched for signs of when he needs to go to the bathroom. Toots has some very normal geriatric vision lost with a milk appearance to his eyes. This gruff old guy has made his way into his foster family's hearts, and we know you would love him too! He is a special guy who is looking for a retirement home and some wonderful people to do what he wants them to do! Why not apply today and show Toots that senior dogs deserve all the love and devotion that we can give them?